37 CFR 3.11 Documents which will be recorded. (a) Assignments of applications, patents, and registrations, and other documents relating to interests in patent applications and patents, accompanied by completed cover sheets as specified in § 3.28 and § 3.31, will be recorded in the Office. Other documents, accompanied by completed cover sheets as specified in § 3.28 and § 3.31, affecting title to applications, patents, or registrations, will be recorded as provided in this part or at the discretion of the Director. (b) Executive Order 9424 of February 18, 1944 (9 FR 1959, 3 CFR 1943-1948 Comp., p. 303) requires the several departments and other executive agencies of the Government, including Government-owned or Government-controlled corporations, to forward promptly to the Director for recording all licenses, assignments, or other interests of the Government in or under patents or patent applications. Assignments and other documents affecting title to patents or patent applications and documents not affecting title to patents or patent applications required by Executive Order 9424 to be filed will be recorded as provided in this part. (c) A joint research agreement or an excerpt of a joint research agreement will also be recorded as provided in this part. 37 CFR 3.58 Governmental registers. (a) The Office will maintain a Departmental Register to record governmental interests required to be recorded by Executive Order 9424. This Departmental Register will not be open to public inspection but will be available for examination and inspection by duly authorized representatives of the Government. Governmental interests recorded on the Departmental Register will be available for public inspection as provided in § 1.12. (b) The Office will maintain a Secret Register to record governmental interests required to be recorded by Executive Order 9424. Any instrument to be recorded will be placed on this Secret Register at the request of the department or agency submitting the same. 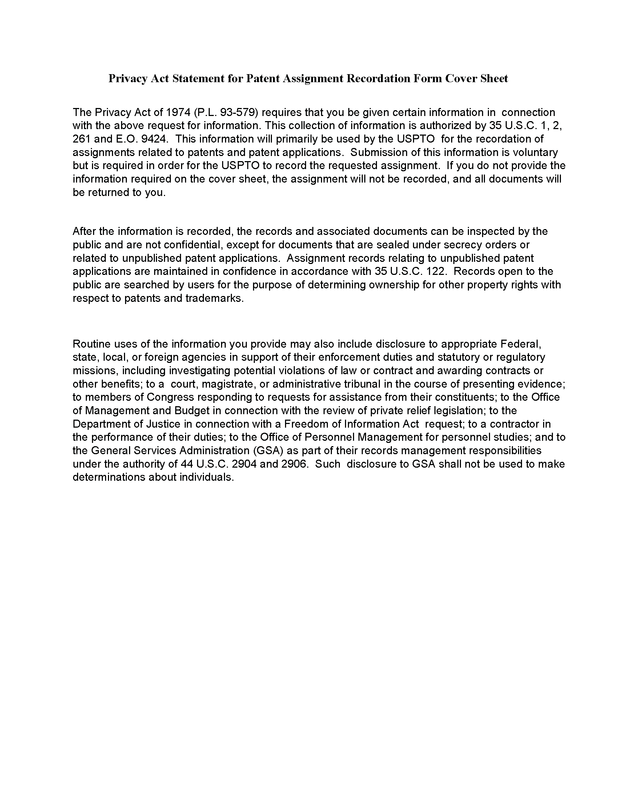 No information will be given concerning any instrument in such record or register, and no examination or inspection thereof or of the index thereto will be permitted, except on the written authority of the head of the department or agency which submitted the instrument and requested secrecy, and the approval of such authority by the Director. No instrument or record other than the one specified may be examined, and the examination must take place in the presence of a designated official of the Patent and Trademark Office. When the department or agency which submitted an instrument no longer requires secrecy with respect to that instrument, it must be recorded anew in the Departmental Register. 37 CFR Part 3 sets forth Office rules on recording assignments and other documents relating to interests in patent applications and patents and the rights of an assignee. 37 CFR 3.11(c) provides that the Office will record a joint research agreement or an excerpt of a joint research agreement. 37 CFR 3.24 Requirements for documents and cover sheets relating to patents and patent applications. (a) For electronic submissions: Either a copy of the original document or an extract of the original document may be submitted for recording. All documents must be submitted as digitized images in Tagged Image File Format (TIFF) or another form as prescribed by the Director. When printed to a paper size of either 21.6 by 27.9 cm (8 1/2 inches by 11 inches) or 21.0 by 29.7 cm (DIN size A4), the document must be legible and a 2.5 cm (one-inch) margin must be present on all sides. (b) For paper or facsimile submissions: Either a copy of the original document or an extract of the original document must be submitted for recording. Only one side of each page may be used. The paper size must be either 21.6 by 27.9 cm (8 1/2 inches by 11 inches) or 21.0 by 29.7 cm (DIN size A4), and in either case, a 2.5 cm (one-inch) margin must be present on all sides. For paper submissions, the paper used should be flexible, strong white, non-shiny, and durable. The Office will not return recorded documents, so original documents must not be submitted for recording. The United States Patent and Trademark Office will accept and record only a copy of an original assignment or other document. See MPEP § 317. The document submitted for recordation will not be returned to the submitter. If the copy submitted for recordation is illegible, the recorded document will be illegible. Accordingly, applicants and patent owners should ensure that only a legible copy is submitted for recordation. 37 CFR 3.26 English language requirement. The Office will accept and record non-English language documents only if accompanied by an English translation signed by the individual making the translation. The assignment document, if not in the English language, will not be recorded unless accompanied by an English translation signed by the translator. 37 CFR 3.21 Identification of patents and patent applications. An assignment relating to a patent must identify the patent by the patent number. An assignment relating to a national patent application must identify the national patent application by the application number (consisting of the series code and the serial number; e.g., 07/123,456). An assignment relating to an international patent application which designates the United States of America must identify the international application by the international application number; e.g., PCT/US2012/012345. An assignment relating to an international design application which designates the United States of America must identify the international design application by the international registration number or by the U.S. application number assigned to the international design application. If an assignment of a patent application filed under § 1.53(b) of this chapter is executed concurrently with, or subsequent to, the execution of the patent application, but before the patent application is filed, it must identify the patent application by the name of each inventor and the title of the invention so that there can be no mistake as to the patent application intended. If an assignment of a provisional application under § 1.53(c) of this chapter is executed before the provisional application is filed, it must identify the provisional application by the name of each inventor and the title of the invention so that there can be no mistake as to the provisional application intended. The patent or patent application to which an assignment relates must be identified by patent number or application number unless the assignment is executed concurrently with or subsequent to the execution of the application but before the application is filed. Then, the application must be identified by the name(s) of the inventors, and the title of the invention. If an assignment of a provisional application is executed before the provisional application is filed, it must identify the provisional application by name(s) of the inventors and the title of the invention. 35 U.S.C. 293 Nonresident patentee; service and notice. Every patentee not residing in the United States may file in the Patent and Trademark Office a written designation stating the name and address of a person residing within the United States on whom may be served process or notice of proceedings affecting the patent or rights thereunder. If the person designated cannot be found at the address given in the last designation, or if no person has been designated, the United States District Court for the Eastern District of Virginia shall have jurisdiction and summons shall be served by publication or otherwise as the court directs. The court shall have the same jurisdiction to take any action respecting the patent or rights thereunder that it would have if the patentee were personally within the jurisdiction of the court. 37 CFR 3.61 Domestic representative. If the assignee of a patent, patent application, trademark application or trademark registration is not domiciled in the United States, the assignee may designate a domestic representative in a document filed in the United States Patent and Trademark Office. The designation should state the name and address of a person residing within the United States on whom may be served process or notice of proceedings affecting the application, patent or registration or rights thereunder. An assignee of a patent or patent application who is not domiciled in the United States may, by written document signed by such assignee, designate a domestic representative. The designation of domestic representative should always be a paper separate from any assignment document, in order that the paper of designation can be retained in the appropriate application or patent file. Also, there should be a separate paper of designation of representative for each patent or application, so that a designation paper can be placed in each file. The designation of a domestic representative should be directed to the Office of Public Records for processing. The address of the assignee may be recited in the assignment document and must be given in the required cover sheet. See MPEP § 302.07. 37 CFR 3.41 Recording fees. (a) All requests to record documents must be accompanied by the appropriate fee. 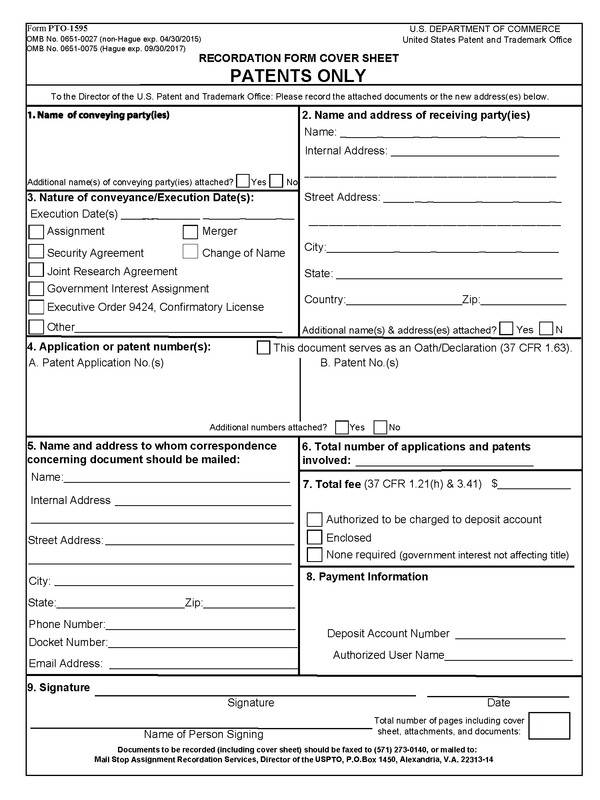 Except as provided in paragraph (b) of this section, a fee is required for each application, patent and registration against which the document is recorded as identified in the cover sheet. The recording fee is set in § 1.21(h) of this chapter for patents and in § 2.6(b)(6) of this chapter for trademarks. (2) The document and cover sheet are either: Faxed or electronically submitted as prescribed by the Director, or mailed to the Office in compliance with § 3.27. The recording fee set forth in 37 CFR 1.21(h) is charged for each patent application and patent identified in the required cover sheet except as provided in 37 CFR 3.41(b). 37 CFR 3.28 Requests for recording. Each document submitted to the Office for recording must include a single cover sheet (as specified in § 3.31) referring either to those patent applications and patents, or to those trademark applications and registrations, against which the document is to be recorded. If a document to be recorded includes interests in, or transactions involving, both patents and trademarks, then separate patent and trademark cover sheets, each accompanied by a copy of the document to be recorded, must be submitted. If a document to be recorded is not accompanied by a completed cover sheet, the document and the incomplete cover sheet will be returned pursuant to § 3.51 for proper completion, in which case the document and a completed cover sheet should be resubmitted. 37 CFR 3.31 Cover sheet content. 37 CFR 3.27 Mailing address for submitting documents to be recorded. Documents and cover sheets submitted by mail for recordation should be addressed to Mail Stop Assignment Recordation Services, Director of the United States Patent and Trademark Office, P.O. Box 1450, Alexandria, Virginia 22313-1450, unless they are filed together with new applications. 37 CFR 3.27 sets out how documents submitted for recording should be addressed to the Office. In order to ensure prompt and proper processing, documents and their cover sheets should be addressed to the Mail Stop Assignment Recordation Services, Director of the U.S. Patent and Trademark Office, P.O. Box 1450, Alexandria, VA 22313-1450, unless they are filed together with new applications. Requests for recording documents which accompany new applications should be addressed to the Commissioner for Patents, P.O. Box 1450, Alexandria, VA 22313-1450. (C) Requests for “at cost” recordation services. If a document submitted by fax is determined not to be recordable, the entire document, with its associated cover sheet, and the Office “Notice of Non-Recordation” will be transmitted via fax back to the sender. Once corrections are made, the initial submission, amended, may then be resubmitted by mailing the corrected submission to the address set forth in 37 CFR 3.27. Timely resubmission will provide the sender with the benefit of the initial receipt date as the recordation date in accordance with 37 CFR 3.51. Assignments and other documents affecting title may be submitted to the Office via the Office’s Electronic Patent Assignment System (EPAS). See the USPTO website at http://epas.uspto.gov for additional information regarding EPAS. (C) payment of the recordation fee by a credit card (use of the Credit Card form, PTO-2038 (see MPEP § 509), is required for the credit card information to be kept separate from the assignment records), electronic fund transfer (EFT) or a USPTO Deposit Account. 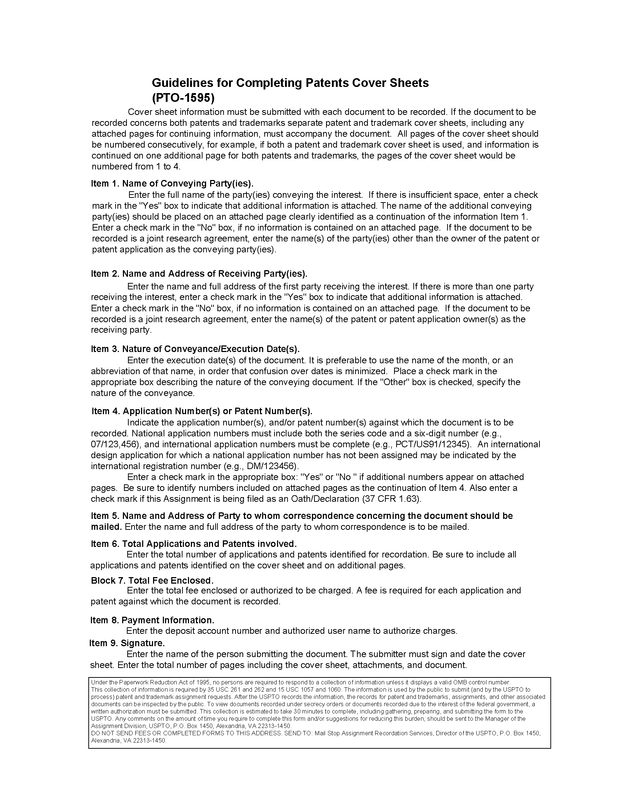 For an assignment document filed electronically, the signature of the person who signs the cover sheet must comply with 37 CFR 3.31(a)(7) or 37 CFR 1.4(d)(2). The date of receipt accorded to an assignment document sent to the Office by EPAS is the date the complete transmission is received in the Office. If a document submitted by EPAS is determined not to be recordable, the entire document, with its associated cover sheet, and the Office "Notice of Non-Recordation" will be transmitted via fax back to the sender. Once corrections are made, the initial submission, as amended, may then be resubmitted by mailing the corrected submission to the address set forth in 37 CFR 3.27. Timely submission will provide the sender with the benefit of the initial receipt date as the recordation date in accordance with 37 CFR 3.51.